Website errors are inevitable. The common ones are pages not found, typographical errors, and links that are not working. We have received a lot of good comments at our RoadTrucker® website and since then we had very much appreciated those who reported the errors they found. 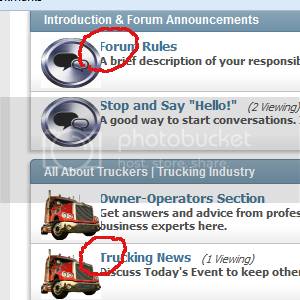 For as much as we strive to provide better customer service, we have created this forum for all of the truckers and customers. We believe that hearing your suggestions are very important so we would like to know your feedback--the good and the bad. If you have some difficulty navigating the page, looking for topics, etc. please feel free to post below. Thanks so much for taking the time to share your thoughts and help us improve this forum for everybody. Hugs! Last edited by Marie; 09-08-2012 at 03:50 AM. Nice to be here but aside from this I'm looking for an info about assisted living Los Angeles. I'm willing to wait for the right answer. I've been looking around quite a bit and must say everything seems to be running very smoothly. Nice layout and functionality. I do want to point out one minor detail. Some of the forum icons are a little bit large and encroach upon the title of the forum (at least in my Firefox browser). Perhaps making these graphics a little bit smaller might make them fit nicely. If you would like me to make them a bit smaller I can actual do this very easily. Just let me know if I can help in that regard. Thanks and keep up the stellar work. I do want to point out one minor detail. Some of the forum icons are a little bit large and encroach upon the title of the forum (at least in my Firefox browser). Perhaps making these graphics a little bit smaller might make them fit nicely.. This is what I'm referring to. I'm using Firefox v 21.0 on my Windows laptop. Hope this helps. We are not seeing that. It is not the pictures. It may be that you have your screen resolution set high. We use a setting for standard laptops and desktops, for now. Phase 3 will take the screen resolution into consideration before downloading. Ok, I was able to duplicate the issue. You are using the Default VBulletin style, instead of the default style and the CSS is not quit right. It allows the icons to move over the text, instead of moving the text over, like our Default style does. We are disabling it, as we do not want to change it, so we can reference it later, if we want to. Thanks for pointing this out. We made some of the icons 60 x 50, which caused the issue to show. We want to keep the icons, as is for now, but may reduce them later. Thanks for you offer to help, but we are fairly well versed in graphics. Notice my graphic was done in .JPG and is larger than yours in .PNG, yet smaller in bytes. Okay great. I don't believe I changed the style at all either so the default might be one you don't expect. Everything looks great on this site! Love it! Thanks for the compliment, collinsexton.